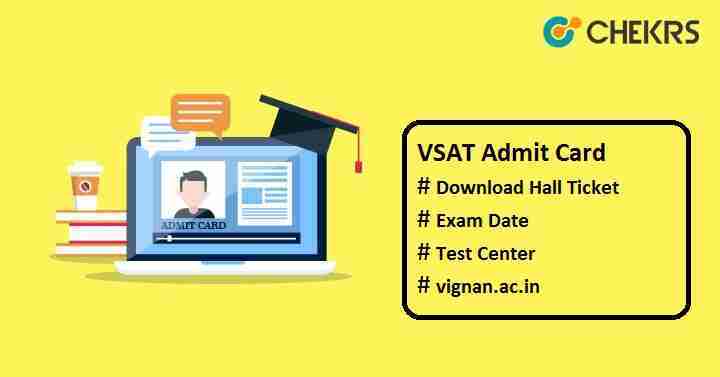 VSAT Admit Card 2019: Vignan’s Scholastic Aptitude Test (V-SAT) is a computer-based entrance exam for applicants seeking admission into BTech or BPharm in Vignan University. To take the exam, you have to carry the VSAT Hall Ticket in the exam hall, as it represents you. The admit card is most important document to be produced by candidates at the exam hall because it includes the candidate’s details like his/ her name, his/ her father’s name, roll no, applied course, address etc. VSAT Hall Ticket Download will be made available to those students who will submit their online application form in a successful manner. Here we have shared the information related to the VSAT Hall Ticket 2019, its downloading process, admit card release date etc. Candidates can check the VSAT Admit Card Date with the VSAT exam date here. This is the expected date based on the previous exam date. We will update it after the announcement of the official date. You can easily get your VSAT Admit Card through online process with the help of given guidelines, once it gets released. Click on the admit card link present on the home page. The “VSAT 2019 Hall Ticket” will be appeared on the screen, download it. After downloading the admit card, don’t forget to take the print-out of it. In order to get entry in the examination center, do not forget to bring your admit card with any one of valid ID proof Aadhaar card/ Driving License/ Voter ID card/ PAN card/ College ID card. Candidates must reach at the exam center one hour before the examination timing. Do not carry tampered or damaged admit card during the exam, you may be disqualified or barred from the exam. Candidates should read all the instructions written on the VSAT Exam Admit Card carefully and follow them strictly.